No, silly not an omelette with chicken in it — An omelette made for the chickens! I worked late Tuesday and forgot to get any offerings from the girls. So yesterday at least one of the three eggs was clearly a leftover. 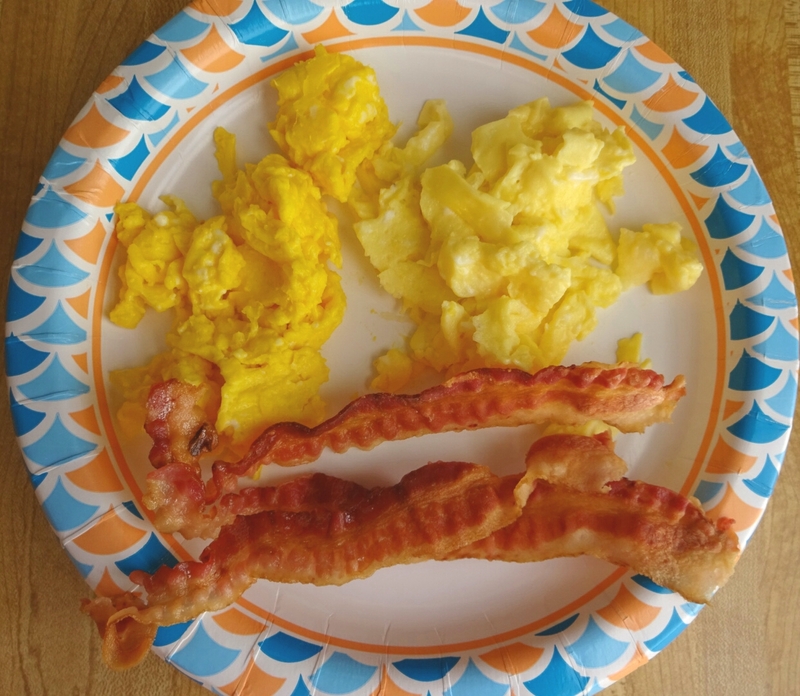 Whenever that happens (although I know in real life that leftover egg is completely safe and fine), I just cook the batch up for the girls. Mix it all together, add a splash of water, and microvave for 2 and a half minutes, stirring once. Garnish with Silas’ leftover Cheerios and — *muah* Magnifique! 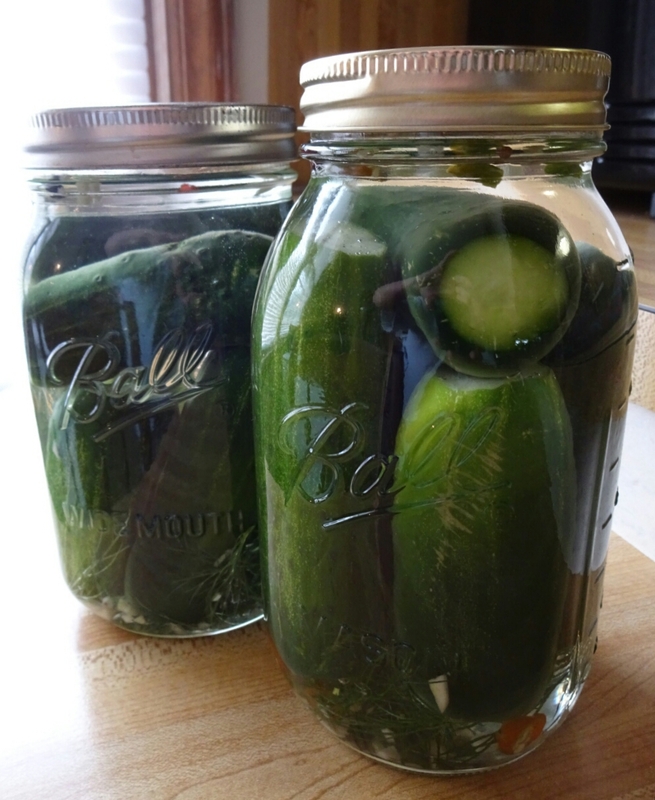 Lacto-fermentation is an old fashioned pickling process that is easy to do and adds probiotics to your diet. I grew a nice batch of hot peppers last summer. Had a few plants each of cayenne and habanero. Had enough to use a bit fresh, freeze a bit, and then put the rest in a quart jar with a couple of garlic cloves and a 4% salt water brine. I weighted the peppers down with a small glass jar and left the whole thing on a shelf in my kitchen for 4 or 5 months. Today I put the peppers in the food processor with a little of the brine and voila! It’s really good! And hot. Eddie and I ate some with tortilla chips and also killed nearly a half gallon of milk. Going to have to grow more plants this year. This sauce is one to repeat. 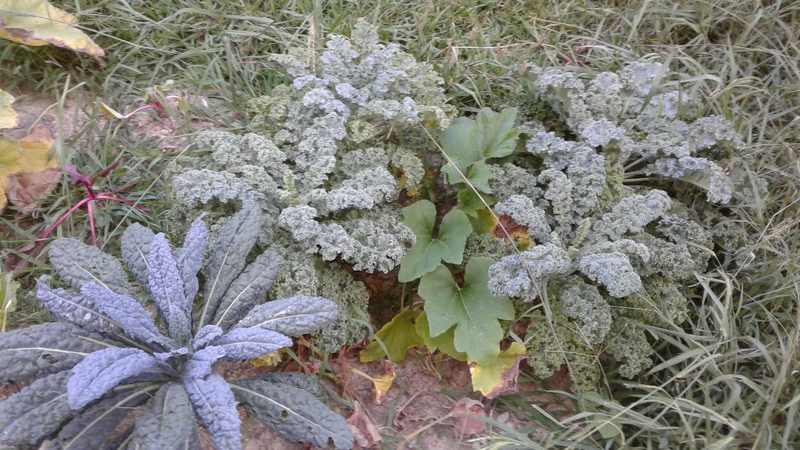 We ate some kale fresh, gave a lot to the chickens, but largely my spring crop was ignored. 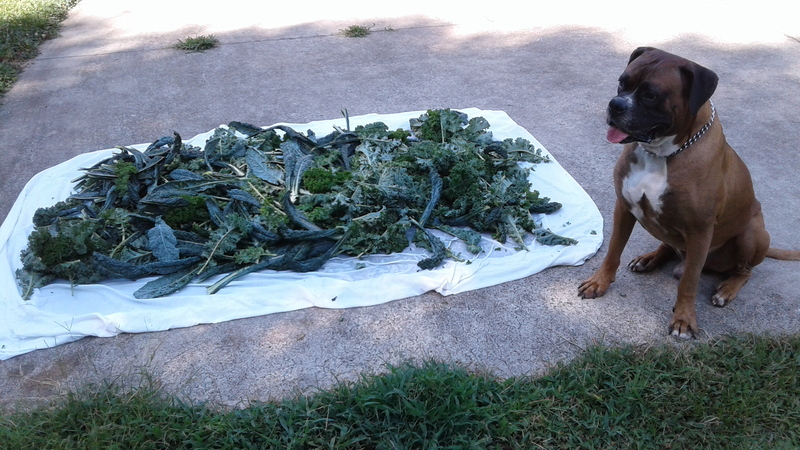 The day I (finally) processed the chard, I already knew that the kale needed attention. And that was over a month ago. 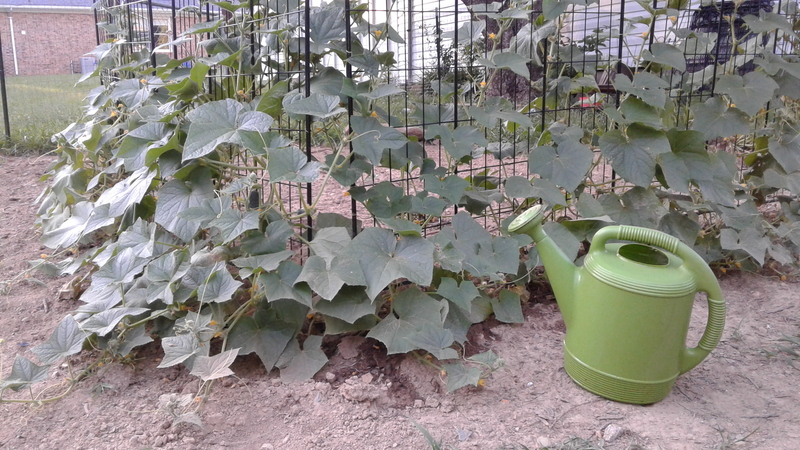 My lovely abundant garden is a weedy mess. It’s time to start working on fall stuff (which will likely be minimal because I’m wearing down) and I really need to get in there and do some cleaning. So I started with cleaning out the kale. The kale was tough and may not come out very good but we are going to eat it, damn it! Outside we washed it, pulled it apart, and deveined it. 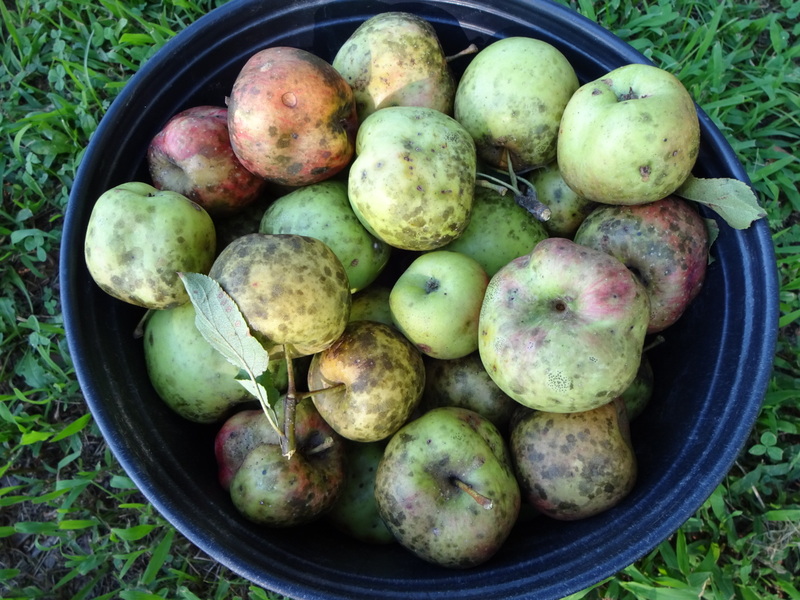 Then I brought the big washtub in and began processing it, batch by batch. 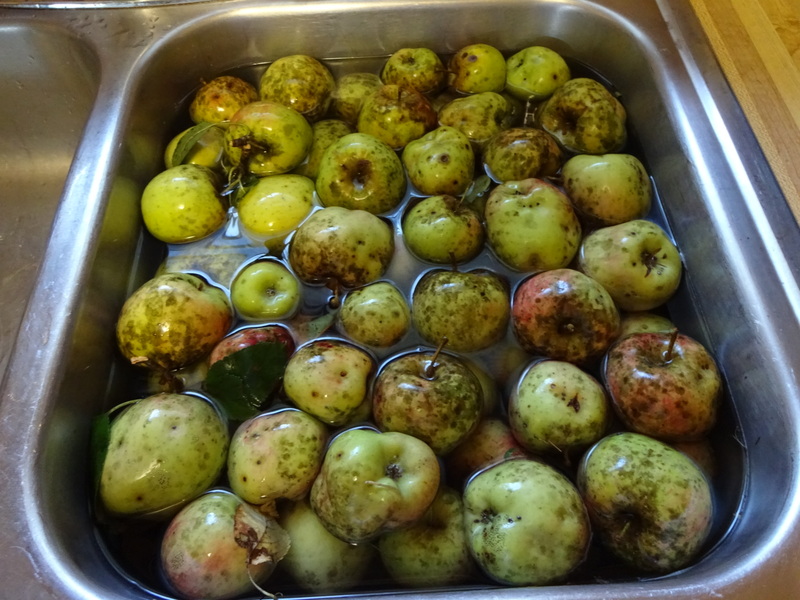 I scooped up big bowls full, chopped it, sorted through it, washed it in a vinegar bath, transferred it to a plain water bath, then steamed it. 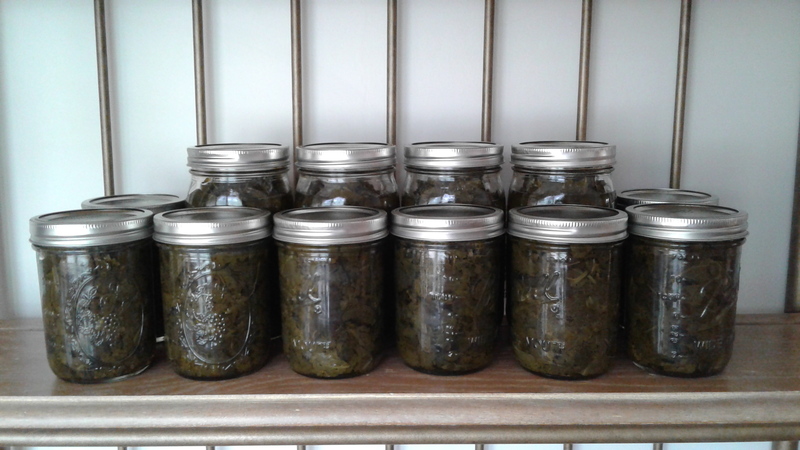 After finding two cooked baby caterpillars, I freaked out and sorted through all the steamed stuff again, and washed it a fourth time before packing my jars. After two pressure canning batches (and about total 12 hours of kale fun) I was still quietly and secretly fretting over the amount of suprise protein that may be in the jars. But then I read this article and felt a hell of a lot better! My cans are probably worlds less buggy than the ones I buy. And they are poison free, to be sure! I tell my kids to eat earthworms if they ever get lost in the woods and so if they find a caterpillar, I’ll just tell them it’s their survival training. 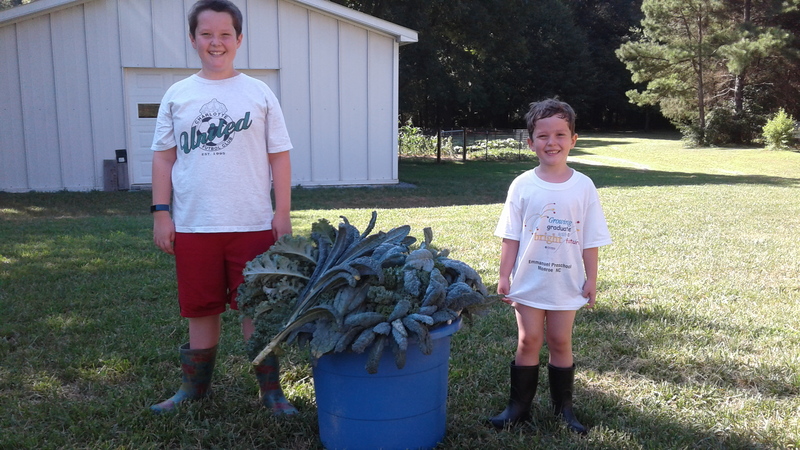 Author Morgan MillPosted on July 16, 2017 Categories Cruciferous / brassicas, Kitchen Witchery and Science, Vegetable gardenTags bugs, home canning, kale, pressure canningLeave a comment on Kale Yeah! Many years ago I had a cucumber addiction and would visit a roadside vegetable stand almost daily, just to buy a few for eating whole. I mostly chalked it up as some cruel Freudian craving because I was very pregnant and Gordon was temporarily living a thousand miles away from me. However I apparently just truly love good cucumbers. 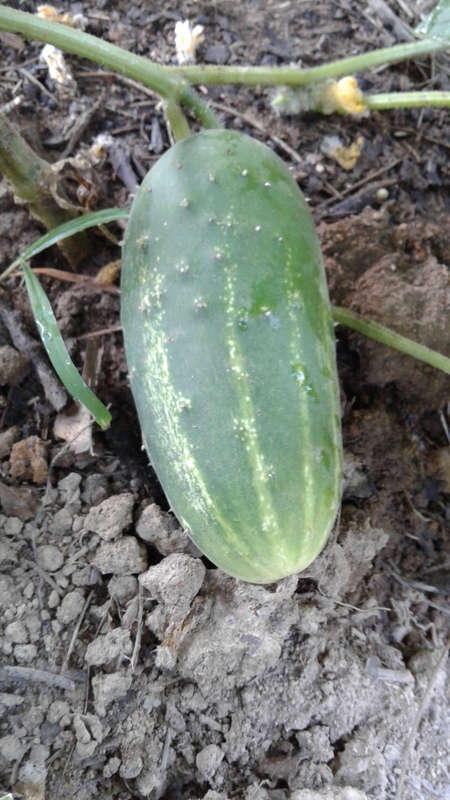 I’ve never grown cucumbers before, but with all of the pickling experiments I’d been doing, I wanted to try and grow a pretty heavy yield. However, as was typical for this season’s start, I had germination problems. I planned for 30 plants and ended up with maybe 16-18 (I forget) of two varieties: Parade Pickles (heirloom seeds I picked up on Etsy) and Picklebush (Burpee). 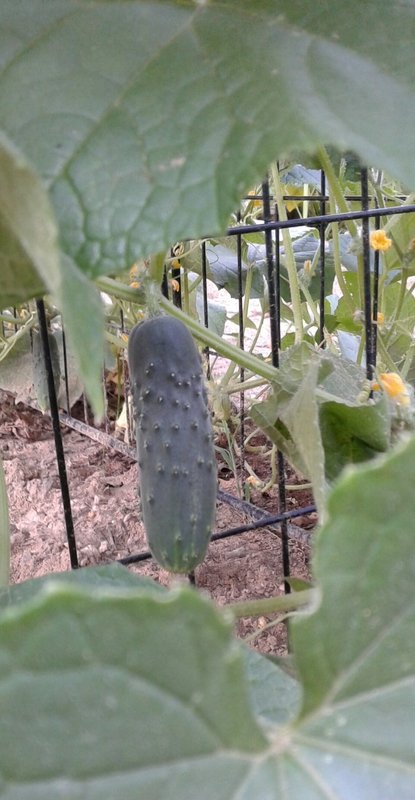 I didn’t even realize that some cucumbers were climbers and some were bush variety until my dad told me that he always grows climbers for space reasons. Then I studied really hard to figure out what I had and how and where to plant them. Perhaps the name PickleBUSH would have sent a signal to a more confident gardener, but not me. I had to obsess for a few days, never sure that I had it right until the plants themselves showed me that all was ok. I love the way my parades look. They are beautiful plants growing so prettily up their fencing trellis. 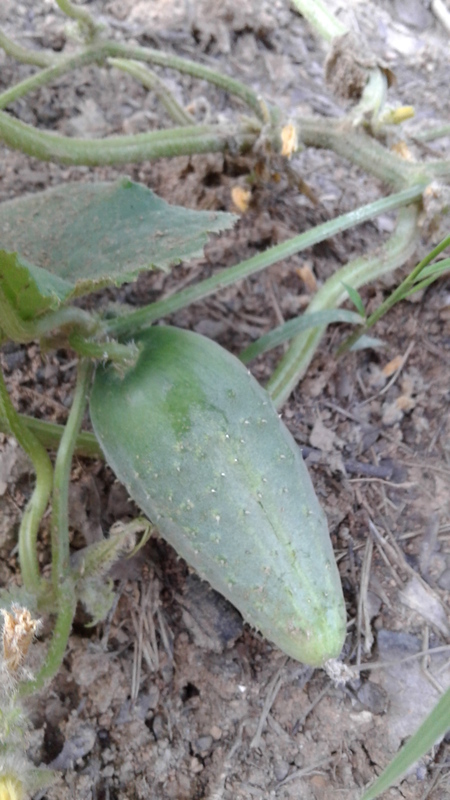 The cukes themselves are dark green and almost perfect cylinders, becoming striped as they thicken. The Parades have an almost floral flavor to them. Picked when small, the skin has very little bitterness. 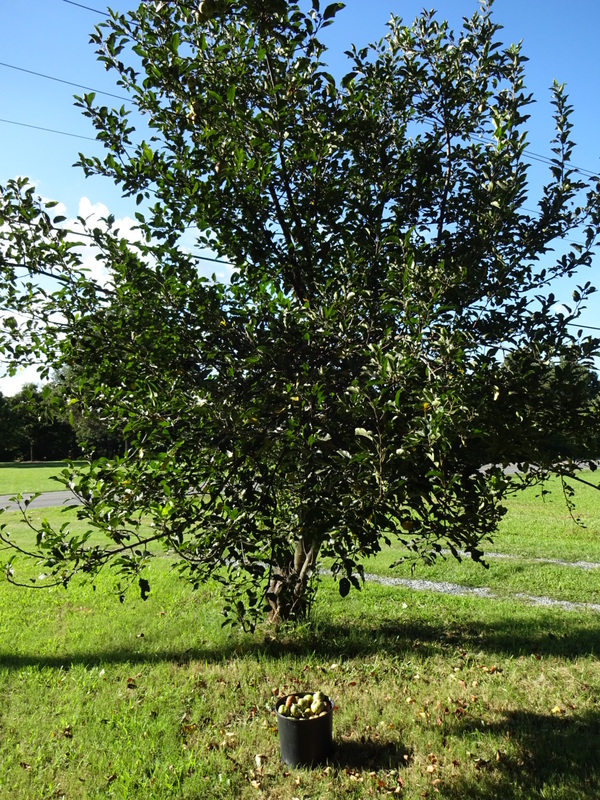 The Picklebush plants are wanderers, but not crazily. They are supposed to be compact for smaller garden spaces. Their color is bright green and I find that they are narrower at the blossom end, but that it seems to even out somewhat as they grow. The picklebush flavor is mild and delicious. They are a very refreshing summer snack and although I still prefer the smaller ones, the cukes that have been left on the vine for a couple of extra days are still great with almost no bitterness. They turned out great! I was worried that I’d overcooked them, but I did not. They have a lovely crispness about them, even after cooking the pickles and the 10 minute water bath to seal ’em up good. 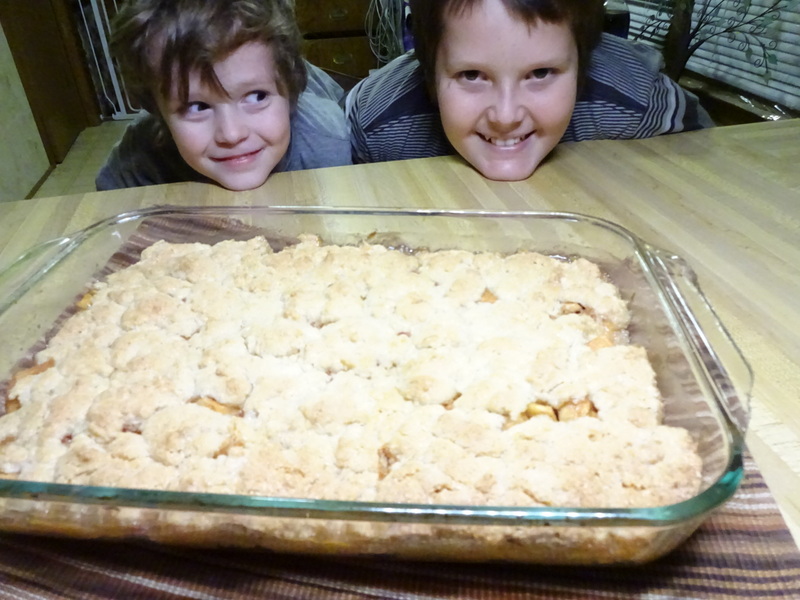 Next time I will cut the sugar by maybe a third and make the pickle slices a bit thicker. Also maybe more onion would be good. 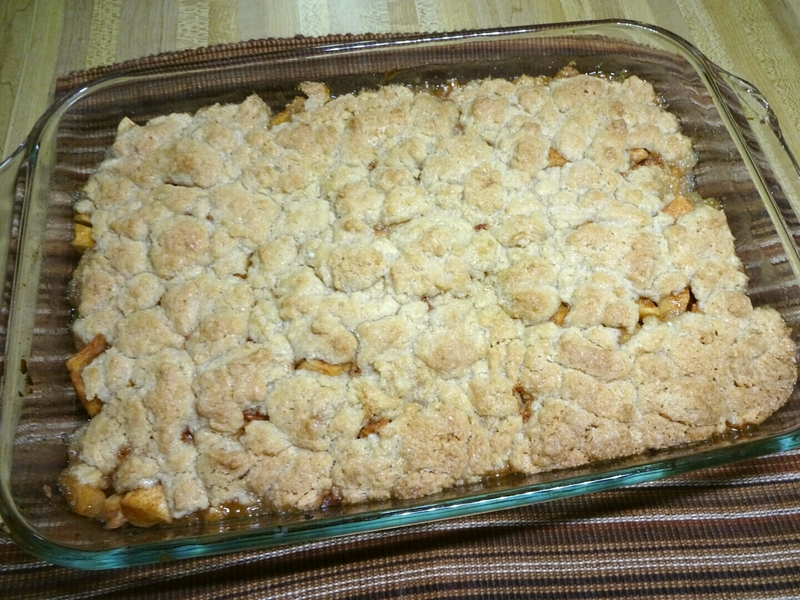 I added a few cloves this time around. 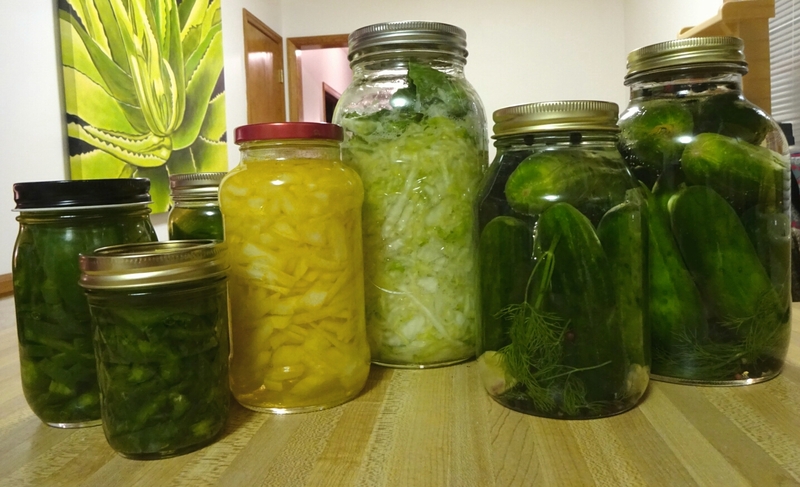 Today I assembled some tried and true lacto-fermented kosher dills (but tossed in a handful of green beans and a few jalapenos). 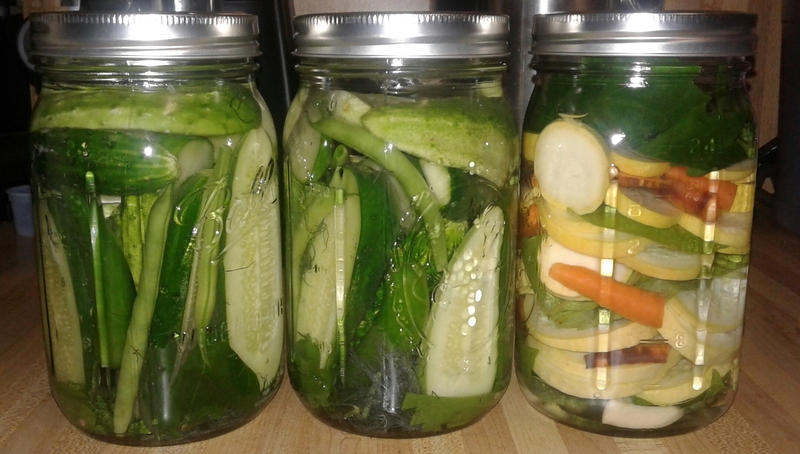 Also found a cool idea online to pickle squash with basil instead of dill, so I’m trying that with garlic (and a few baby carrots for fun), also lacto-fermented. 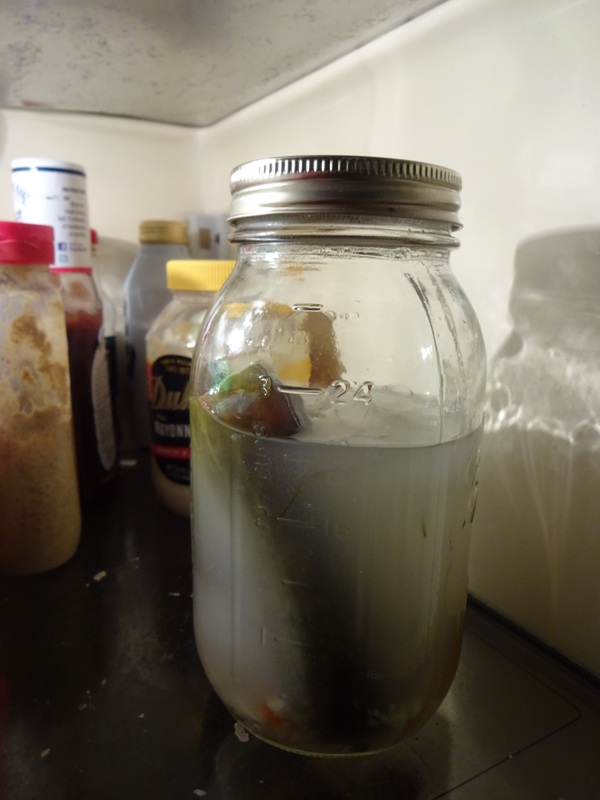 The dill I had stored in the freezer in a gallon bag because it was all ready when the pickle plants were newborns. The large leaf basil was freshly picked today. 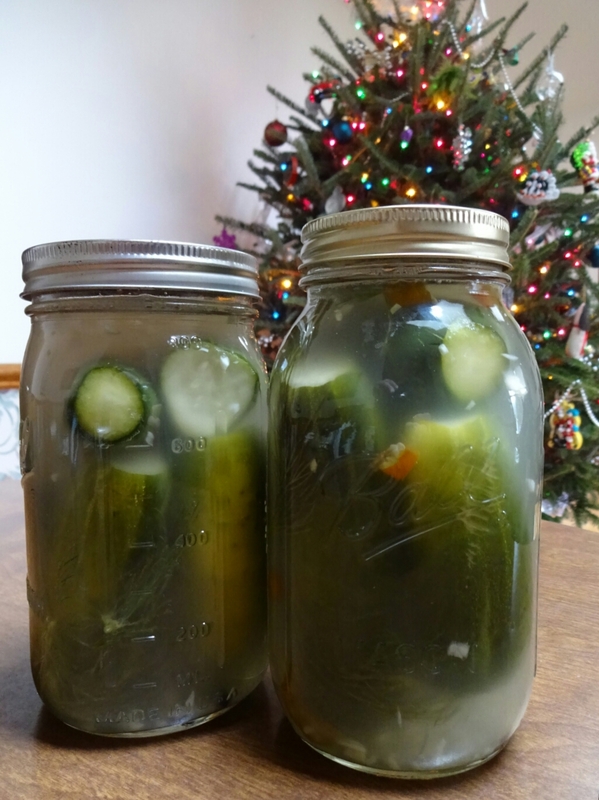 I love the fermented kind of pickles for not only their healthy probiotic properties, but because they’re so easy to do! So far I’ve found that everything works well with a 3.5% salt water brine poured over whatever ingredients you like. Then they can sit (in a tray of some kind) on the kitchen counter for 2-3 weeks depending on what it is and how big the pieces are. (I did a chopped onion and it took forever!) The fermented pickles should get bubbly and then cloudy and usually they have some minor pressure explosions (hence the tray). And you can just keep tasting until they’re done. But tasting messes up the dynamics inside the jar, so it’s an adventure. I’m excited to try weird basil squash pickles. I’ll let you know what happens! It’s challenging to keep up with processing the succesful harvest extras from the spring garden while trying to get the summer garden going. But that’s what I wanted: Lots of food that can be stored and used later. 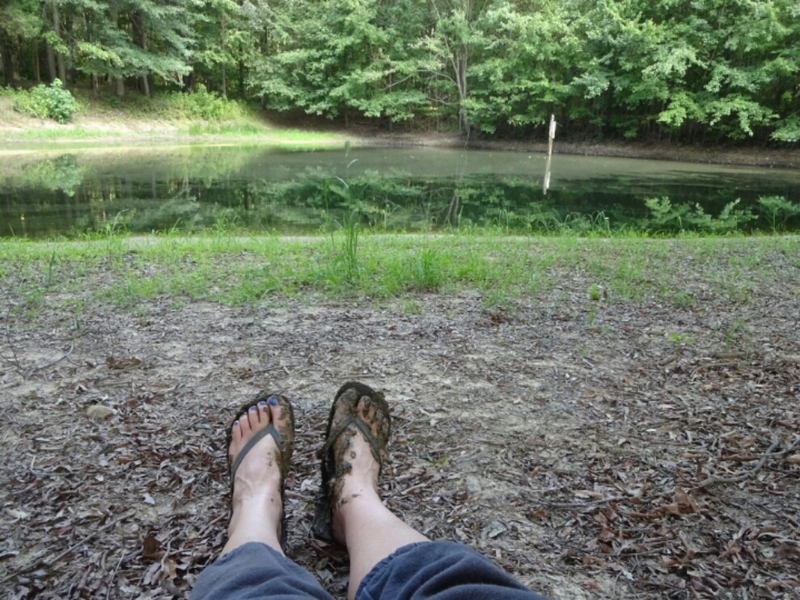 Like Homesteading Lite…. 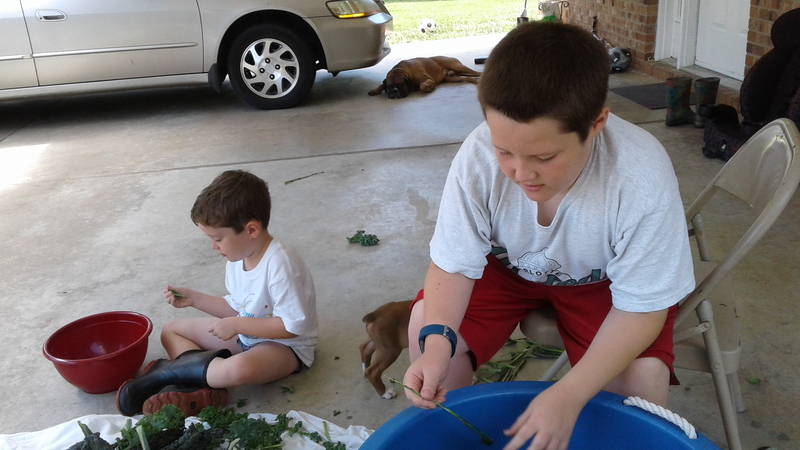 turning seeds into groceries all while having a full time job and a family. 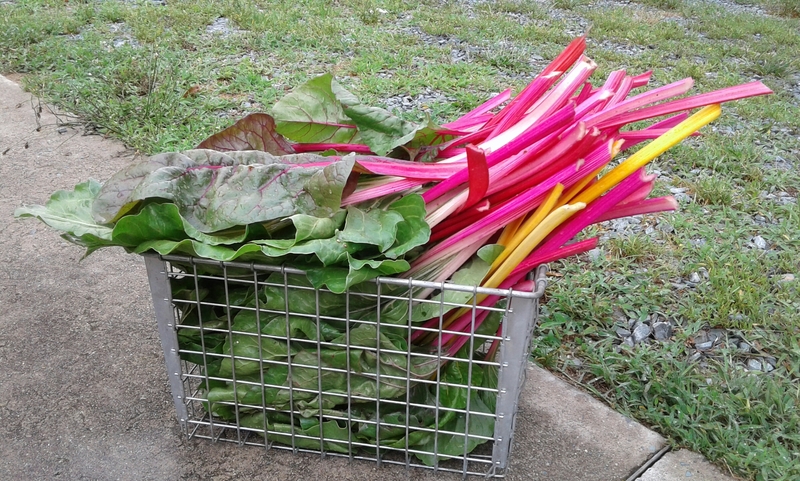 My beautiful chard had been getting neglected. Mature stalks, speading out and lying on the ground until I’d rip them off and toss them to the ladies in the chicken coop. Until today. Today I planned to blanch and freeze my kale, make chard stem pickles, and use the chard leaves for dinner along with the few turnips that surprised me this morning. 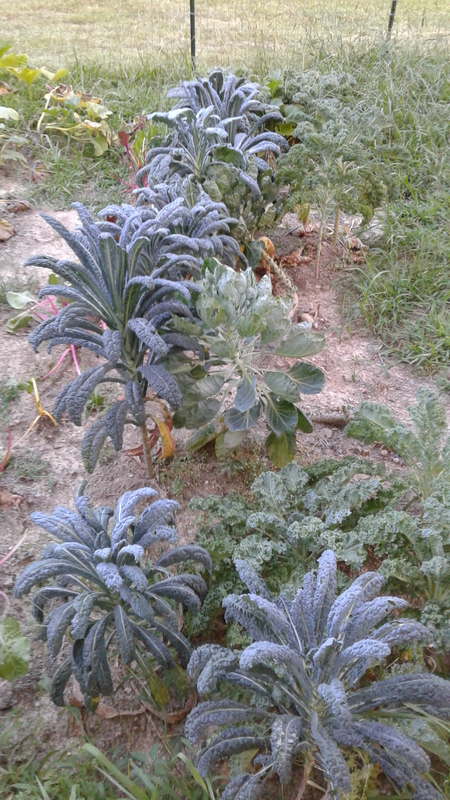 So the kale is still in the garden, getting blissfully soaked by a quick downpour. But I did manage to do up the chard. 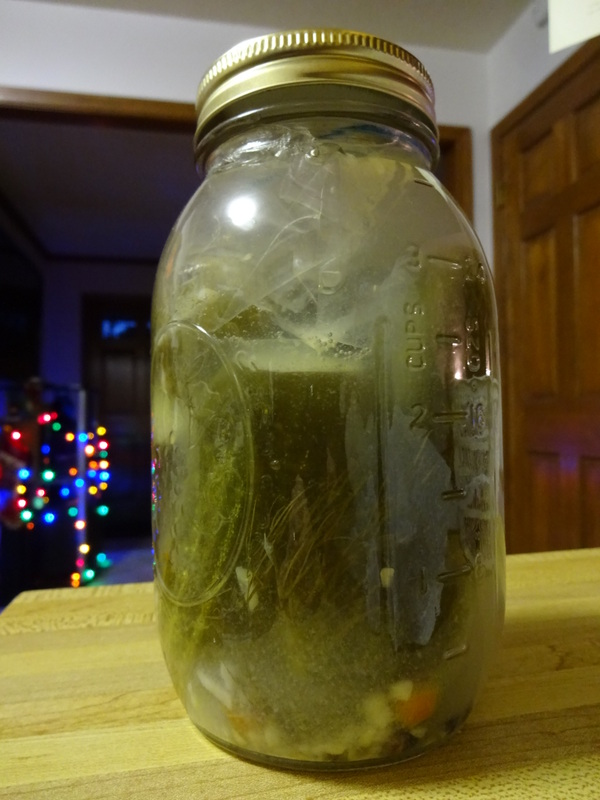 Made pickles and chopped, blanched, and came up with a single flat gallon bag to freeze. Dinner is Hamburger Helper and store bought corn on the cob that had been hanging out in the fridge for a week. 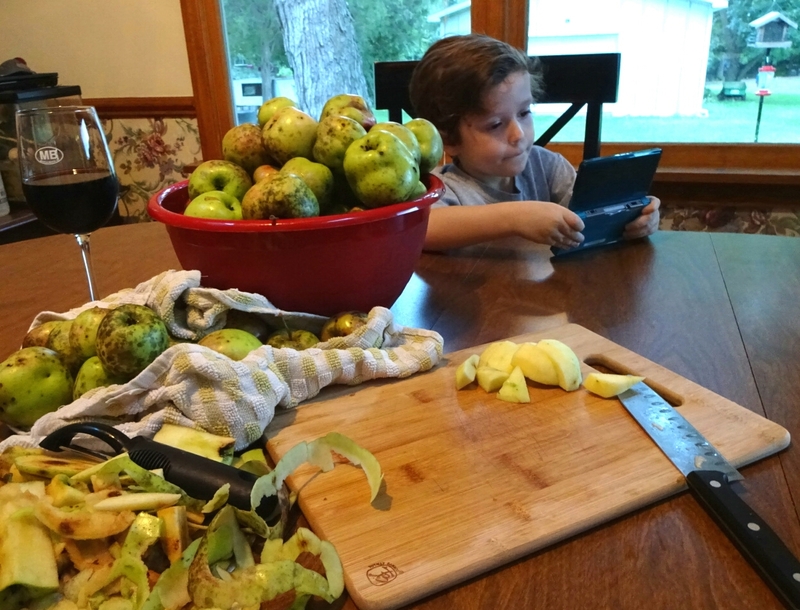 Also Gordon is cooking while I sit blogging and watching the boys play a video game with hopelessly chard-stained fingernails and uncleaned toilets calling my name. Pickled cucumbers: Pretty much the same as last time, but using a digital scale made it much easier to get a 3.5% salinity for the brine. Used a whole produce pack of dill spread among 3 jars, kept my garlic cloves whole (maybe 3-5 per jar) but crushed them, and used a bunch of peppercorns in each jar. 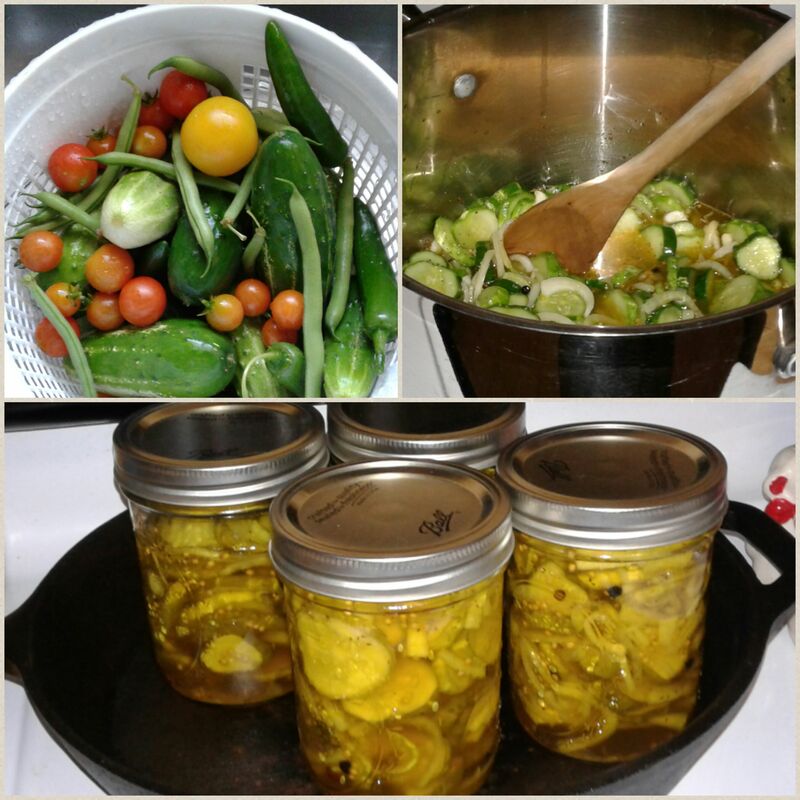 So that’s it: dill, garlic, peppercorns, tightly packed super clean cukes, and brine. Oh and I didn’t cut off any pickle butts this time. Sauerkraut: This was actually really fun because of the transformation that happened in my hands. Green cabbage with the core removed, sliced into short thin ribbons. Sprinkled 1.5 tablespoons of salt over the cabbage in a very large bowl. Massaged the cabbage and salt together until cabbage became very limp and watery (several minutes). Pushed into a half gallon jar using a canning funnel. Poured the derived liquid into the jar. Covered with a couple of clean outer leaves to keep shredded stuff submerged. I will keep pressing periodically for first 24 hours to encourage more liquid. Using a large pestle to press with. This will probably need to be moved into the basement because it already smells like the kitchen is farting. Onion: Just for fun I sliced up a couple of onions and used the same 3.5% pickle brine, with a teaspoon of turmeric added. I love pickled onions! Poblano peppers: These bad boys ruined my evening because of my own dumbassery. I know, poblanos are famously not really hot. But they were hot enough to set my hands aflame for hours. 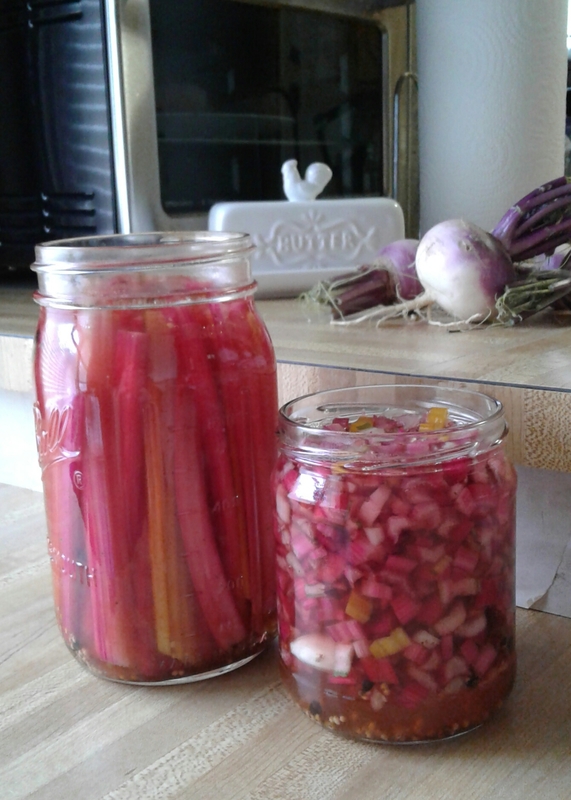 There was a 1.5 lb pack on sale for 99 cents so I (sliced them all up without gloves) bought them and realized that using whatever sale veg comes my way is such a brilliant and thrify way to have a million different jars of probiotic awesomeness! 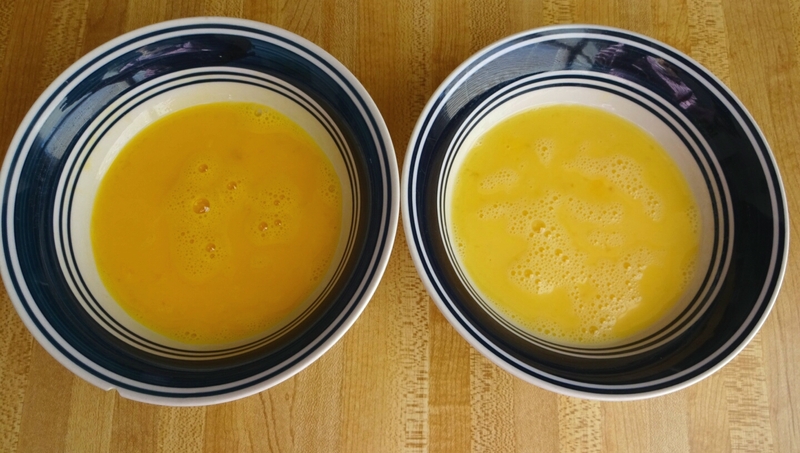 So anyhoo… They got the leftover tumeric onion brine diluted with more plain brine and then a half cup of raw organic Florida (shout out to my place of origin) cane sugar. I honestly planned on spending most of the day on the couch today. 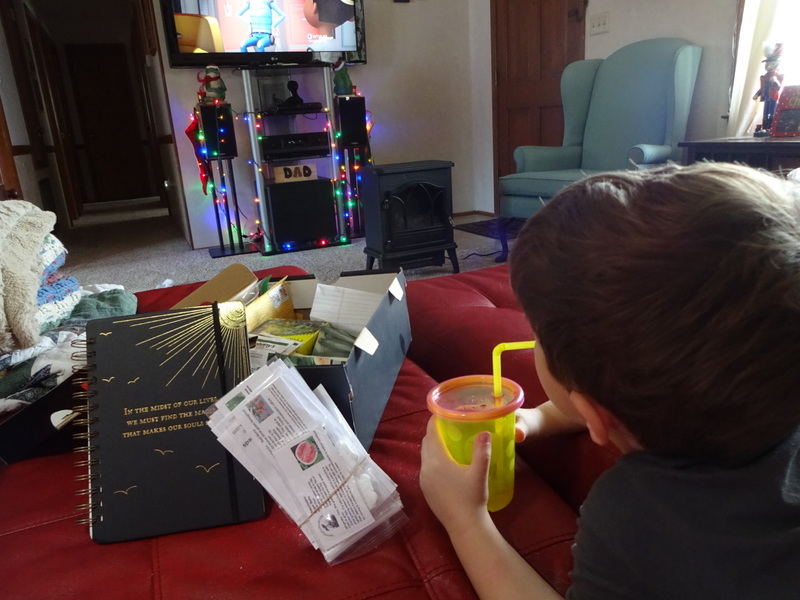 It’s staycation day 4 of 4 and I wasn’t going to cook or anything – maybe just play with some seeds along with cuddling with kiddos. But my brave little chickens have been leaving the yard and when I went to hunt them down, I couldn’t in good conscience waste the beautiful warm weather. 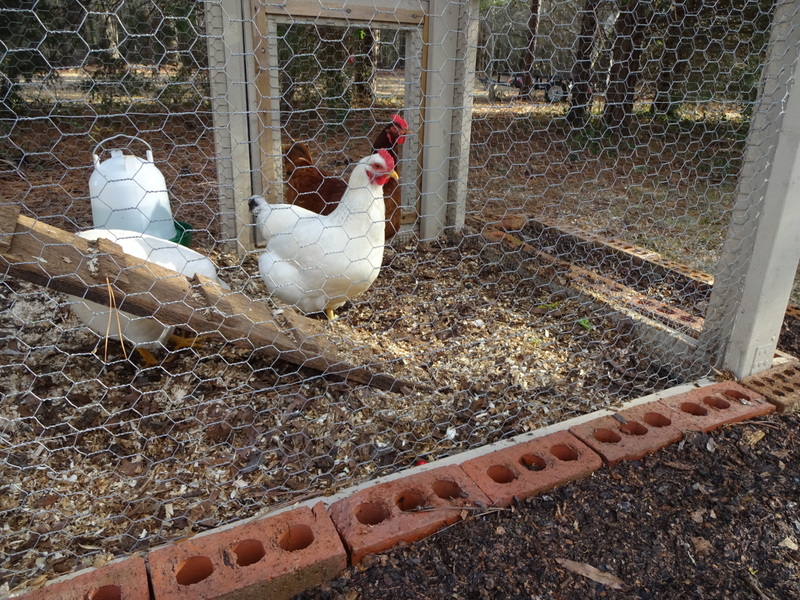 So with Silas’ help, I built the chicken garden. 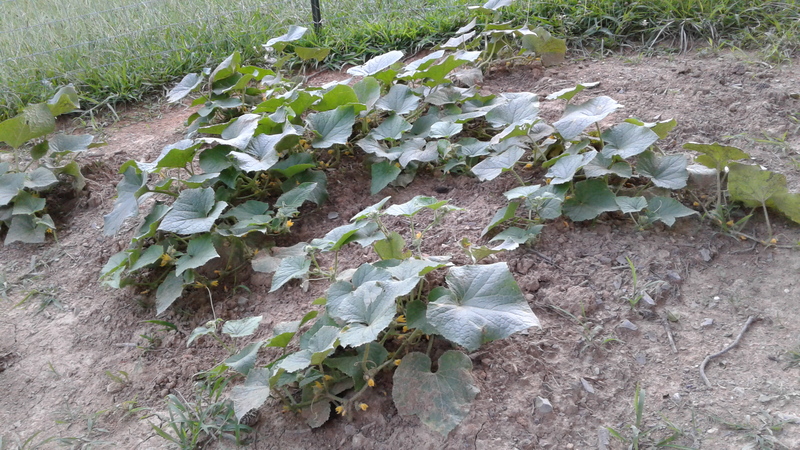 The chicken garden’s purpose is to beautify the chicken coop / herb garden area while providing a place to grow things the chickens may like to eat. It surrounds the coop on three sides. I used about 120 reclaimed bricks that we are fortunate enough to have lying around, and soil from last summer’s potted vegetable garden. 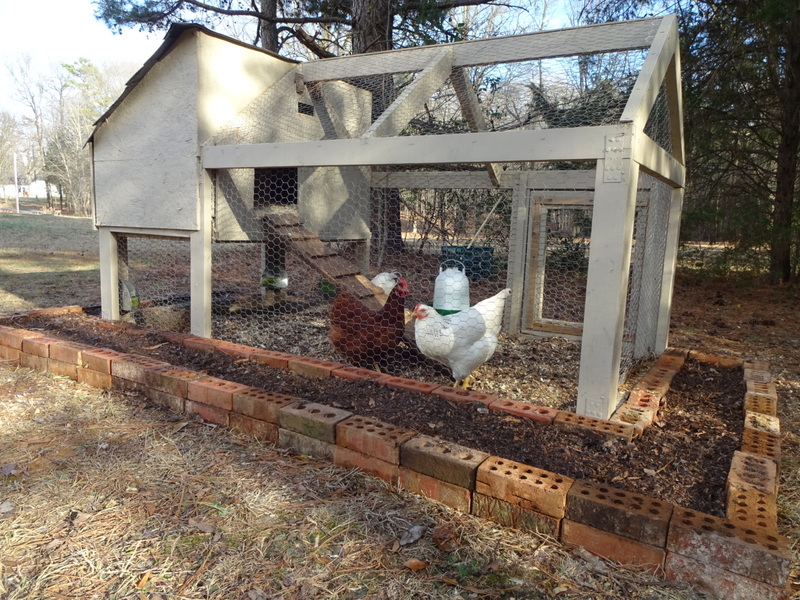 I placed the large-holed bricks near the coop, in hopes that I can grow a single climbing edible in each (like a snow pea or nasturtium), to nourish and entertain the girls while they are confined. Then, because I’m all into fermenting these days and because apparently fermented chicken feed has magical properties, I mixed up a batch to “cook”. 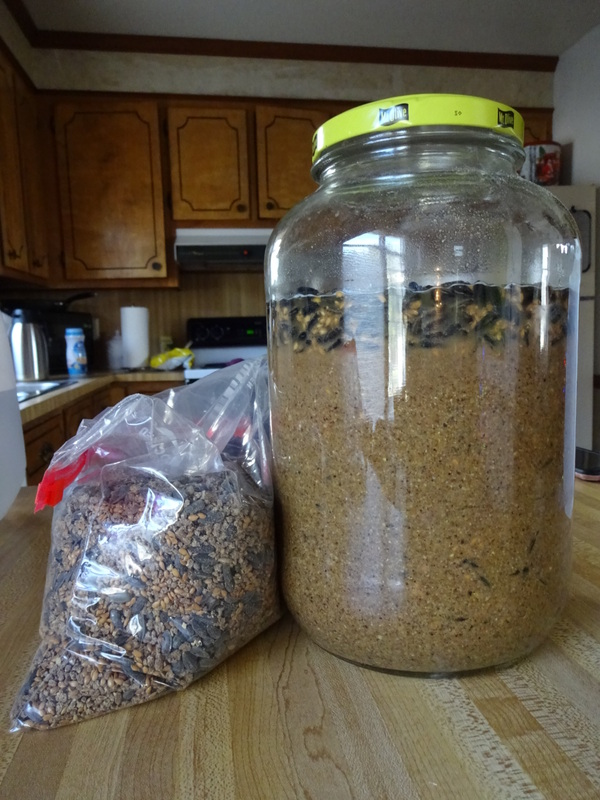 This concoction is their normal feed crumbles, black oil sunflower seeds, and some flax seeds. I covered it with water and I’m going to wait for it to start bubbling, adding water when it expands. And now I’m going to play with seeds. My new journal for 2017 came today, so let the planning begin! Cut off pickle ends and put them in jars whole, wedging a couple across tops to prevent floating. Poured in brine, leaving a bit of headspace. Saved leftover brine and put into fridge. Closed into regular mason jars, will have to burp them when fermentation starts, hope they don’t explode. May switch to coffee filter with rubber band. Brine a bit cloudy. No pressure on lids yet. Scooped a few stray floating spices off the top. Brine very cloudy. Pressure on the lids. Burped them without issue. Tried to poke down floating spices some. Brine tastes wonderful. Some bubbles appeared to be coming up through a pickle. Pickles no longer bright green. Very cloudy. Very fizzy. Upon opening, got a lot of activity but otherwise regular rings and lids are working well. Losing the floating battle though. Pickles are staying put pretty well, but seasonings are not. Next time would leave pieces large. The color looks like what I’ve seen other bloggers call half-sours to me. Another week should do it. I may taste them sooner, but if I do then my pickle wedge system will be ruined. The bubbles stopped completely. I looked online for fermentation stages and whatnot, but since I just got home from work and it was dinnertime, I wasn’t patient enough to really find any good information. So what the hell? Let’s slice and try one of each. Gordon said: Pretty bland. Definitely more cucumber than pickle ; Eddie said: The spicy ones aren’t very spicy. Ah well. So I filled up the empty space with a brine-filled ziploc sandwich bag (using my leftover brine) to weigh everything down and hopefully prevent mold. Should leave them alone for another week. I cracked the hot ones open today. The jar was full of broken down sediment. Crunchy, salty, full of yummy flavor. Put the remaining hots in the fridge and left the other ones out on the counter because Gordon thought they could go a little longer and I’m curious about the next phase anyway. 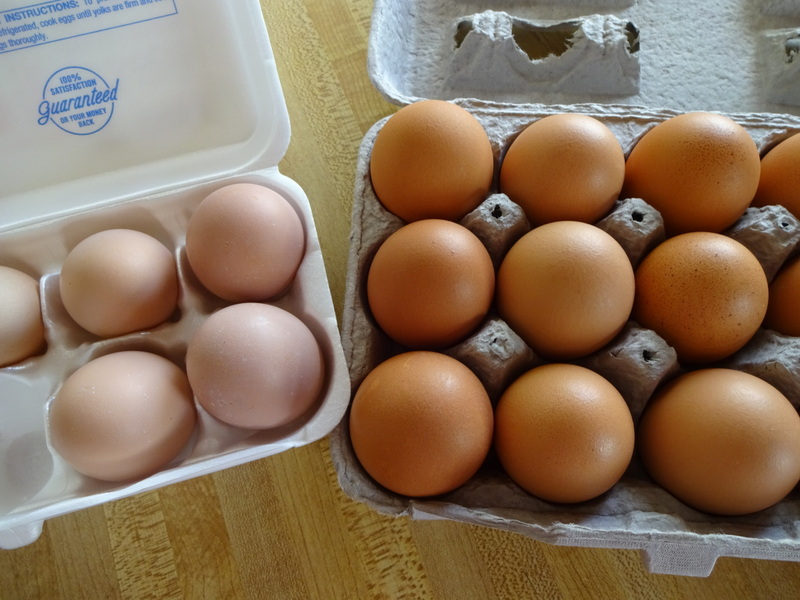 We broke down and bought eggs when Rosie quit laying. But apparently she was just a bit traumatized by the change in her living situation because after she settled in, she began laying every day. 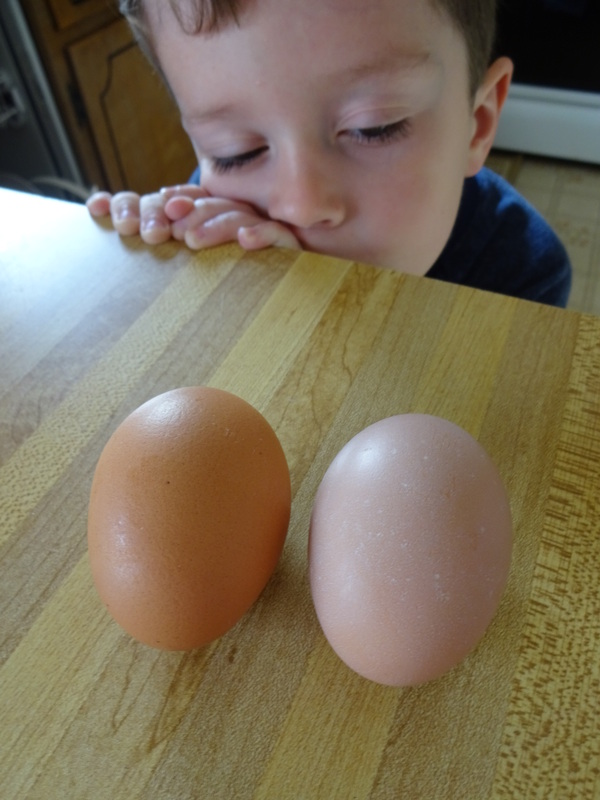 After collecting a few days’ worth, I thought it would be good to compare Rosie’s eggs with the store bought eggs. 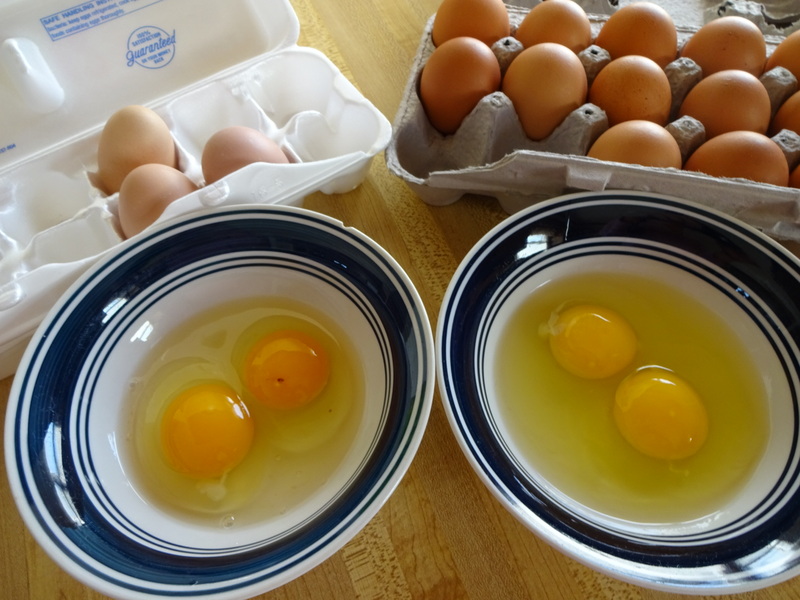 Rosie’s eggs are smaller and lighter in color but the yolks are a much darker incredibly lovely shade of gold. However…..flavorwise. Not sure. 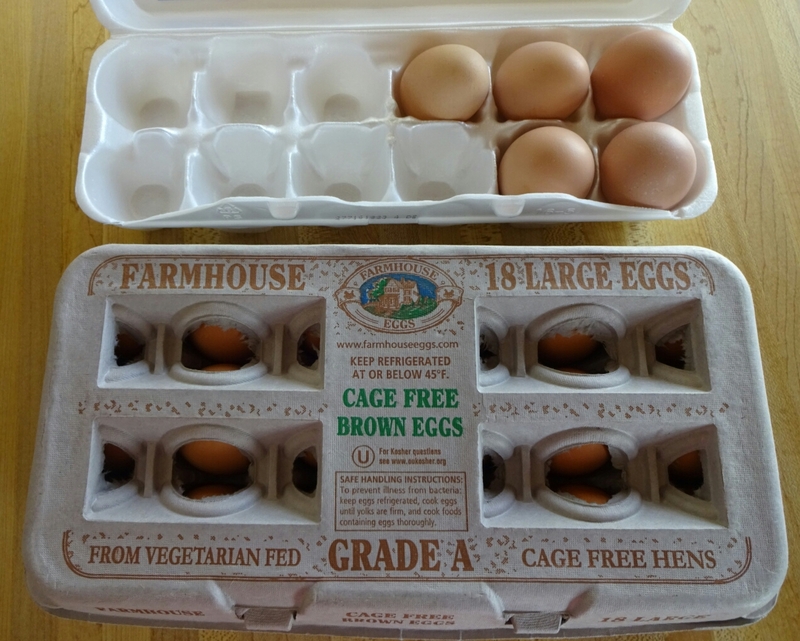 Store eggs may actually have had a bit of a stronger flavor.